What's cuter than happy bunnies? Happy, well-behaved kids! 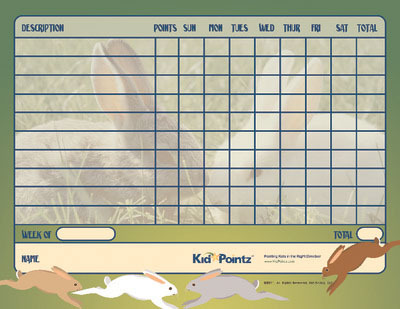 With our bunnies themed kids behavior charts your little ones will quickly learn to love earning rewards through upholding their responsibilities and acting in a positive manner. When paired with Kid Pointz online rewards, these charts will have your kids hopping for joy after every accomplishment!